Day 23 of the 30 Paintings in 30 Days challenge. Wow, I can't believe there is only one week left. I think my back will be happy to be done on the 30th. Way to much sitting for me! Today's painting has the alliterative title "Kite, Kiwi, and Keys". 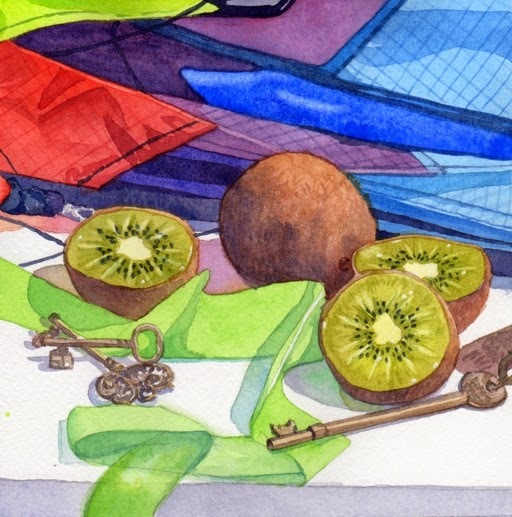 I enjoyed painting the bright kite and the slightly more subdued kiwi and keys together. The kite fabric was enhanced by painting the thin lines of the square weave in parts of the image. The kite reminds me of flying a kite as a kid, but also Benjamin Franklin and the myth that he flew a kite with a key attached to it in a thunderstorm. The kiwi was painted using olive green with a little New Gamboge mixed in to brighten it up a little. "Kite, Kiwi, and Keys" is a 6"x6" watercolor and it is available for purchase on Daily Paintworks for $90. Click here to purchase.